Background: The etiology of attention deficit hyperactivity disorder (ADHD) is not exactly known and its etiology is multifactorial. The usual treatment for these children is based on pharmacotherapy treatment, although the pharmacotherapy has a high effectiveness in ADHD treatment, it often causes different side effects. Existing evidence suggests that children who receive mineral supplement without considering their age and supplement formula may perform better on different behavioral tests compared with those receiving placebo. Methods: In this study, we tried to review the previous evidence regarding the effects of minerals in prevention and management of ADHD. We searched PubMed/Medline, Google Scholar, Ovid, Scopus, and ISI web of science up to June 2013. "iron," "iron supplementation," "magnesium," "magnesium supplementation," "zinc," "zinc supplementation," "attention deficit hyperactivity disorder" were used as the keywords. Totally 11 randomized controlled trials were eligible to be included in the systematic review. Results: Our review showed that we don't have any predominant evidence about using mineral supplementation on children with ADHD. Conclusions: We need more evidence for indicating the effect of zinc, magnesium, and iron supplementation in the treatment of ADHD among children. Many psychiatrics use methylphenidate and amphetamine for the treatment of ADHD and these drugs are very effective for the treatment of this disorder. However, 30% of persons who treat by methylphenidate or amphetamine have adverse effects such as abdominal pains, anorexia, weight loss, headaches, irritability, depressed mood and appetite, sleep disturbances. , For this reason, scientists have been initiated new researches for ADHD treatment. Studies had reported that children with ADHD had significantly lower serum levels of iron  and magnesium  than controls. Iron is a cofactor for tyrosine hydroxylase, the rate-limiting enzyme of monoamine synthesis, so it regulates dopamine and noradrenaline production. Magnesium contributes in protecting neuronal cell membranes and modulates neurotransmitters release in the brain. With this evidence, it may suggest that zinc, magnesium, and iron may be useful in ADHD treatment. One study showed that 12% of children with ADHD had used complementary or alternative medicines including mineral supplement. Hence, we need evidence to support this claims of efficiency, especially among children. Previous studies have explored the effect of iron, magnesium, and zinc supplement on ADHD treatment. However, to date no comprehensive systematic review has been conducted in this regard. Therefore, our aim in this article was to present a systematic review of studies regarding zinc, magnesium, and iron supplementation in treating ADHD. Our inclusion criteria were: (1) Randomized controlled trial (RCT) in design; (2) conducted in children; (3) Intervened using iron, magnesium, and zinc; (5) No other food and diet was used in intervention or control group. Among remaining studies, those trials that met at least one of the following criteria were excluded: (1) The outcomes had not been clearly stated; (2) Studies without clear inclusion and exclusion criteria; (3) studies on participants with age more than 18 year; (4) food or food groups high in zinc, iron, and magnesium were used instead of zinc, magnesium, and iron supplementation for treatment. We extracted some data from each article about: Name of first author, publication year, place of study, study design, number of patients, study duration, population, dose and type of oral supplementation, main outcome measure, the evaluation of baseline Zn, Mg, Fe status, and effect of supplementation. We used Jadad score for analyzing the methodological quality of each paper  (as first used in Sarris and Byrne,  and in subsequent reviews, e.g. Pase et al. ). After using the quality control of each article on the basis of Jadad, we assigned, quality scores ranging from 4/10 (low) to 8/10 (high). Of 135 potential studies in the area of zinc, iron, and magnesium supplementation on ADHD, 12 papers were duplicated and 102 were irrelevant. Overall 18 articles were a clinical trial, 4 articles had done on healthy children, and two articles were about the effect of omega-3 on ADHD children with zinc and magnesium deficiency. This left 11 articles for inclusion [Table 1]. 5 articles were about magnesium supplementation; 2 articles were about iron supplementation; and 4 articles were about zinc supplementation [Figure 1]. In our systematic review of the literature, four articles were located that met inclusion criteria for zinc supplementation and ADHD, two articles producing significant positive results on the main primary ADHD outcome measures. Bilici et al. had done a large randomized clinical trial in 400 children with ADHD. Children were randomized to a high dose of zinc (150 mg/day) and they experienced significant improvements in hyperactivity and impulsivity (but not inattention). A high drop-out rate in this study may, however, place a limitation on the significance of findings. In another study by Akhondzadeh et al.,  they added zinc (55 mg/day) to psychostimulants (1 mg/kg/day) in 44 children which resulted in a greater improvement in symptoms than use of the psychostimulant alone. The results of two other studies by Arnold et al. and Zamora et al. indicated that zinc supplementation did not have any effect on ADHD symptoms. It is possible that insufficient dose of zinc causes different results in compared with other studies. In Arnold's study zinc glycinate was randomly assigned to two dose groups (15 mg/day or 30 mg/day) among 52 children with ADHD for 13 weeks (8 weeks monotherapy and then 5 weeks with added d-amphetamine). Their results revealed on ADHD outcome scales that no significant improvements occurred with zinc supplementation in either intervention group or placebo. Zamora et al. in a controlled, double-blind study on 40 ADHD children showed methylphenidate (0.3 mg/kg/day) and zinc (sulfate) 10 mg/day for 6 weeks did not improve ADHD symptoms. About iron and ADHD there were one randomized double-blind placebo-controlled trial and one open trial without the controlled group. Konofal et al. in a RCT involved 23 non-anemic ADHD children (with a small placebo group [n = 5]), with abnormally low serum ferritin levels and showed oral iron (ferrous sulfate 80 mg/day) improved ADHD symptoms over placebo. Sever et al. evaluated the effect of iron supplementation ([Ferrocal], 5 mg/kg/day for 30 days) on the level of ferritin and ADHD symptoms in 14 boys with ADHD. Results showed significant increase in serum ferritin levels and significant decrease in the parents' Conners' Rating Scale scores. In our systematic review, there were just one magnesium monotherapy, therefore the studies, which included multicomponent supplements with magnesium were reviewed. Huss et al. used 80 mg/day magnesium in combination with polyunsaturated fatty acids (PUFA) and zinc for 3 months. Their study reported this supplementation decreased both inattentiveness and hyperactivity/impulsivity. Mousain-Bosc et al. 's study  was an open-label study without any control group. They reported that magnesium and Vitamin B6 supplementation (6 mg/kg/day Mg, 0.6 mg/kg/day Vitamin B6) on 52 ADHD children decreased scholar inattention after 4 months. Mousain-Bosc et al. in another study with open controlled trial design confirmed that magnesium supplementation with Vitamin B, without any psychotic drug increased the magnesium plasma level and decreased hyperactivity/inattentiveness. Starobrat-Hermelin and Kozielec  evaluated the effect of magnesium mono-therapy in a dose of 200 mg/day on hyperactivity in ADHD children with magnesium deficiency (n = 75). After 6 months, an increase in magnesium contents in hair and a significant decrease in hyperactivity has been achieved. This is the first systematic review of the efficiency of zinc, magnesium, and iron supplementation among children with ADHD. Of the four studies that met inclusion criteria about zinc supplementation, one was effective on total ADHD score the second was positive on hyperactivity but showed no effect on inattentiveness. The third and fourth trial was entirely negative. Billici et al. in a large randomized clinical trial prescribed a high dose of zinc to children and experienced significant improvements over placebo in hyperactivity and impulsivity but not inattention. A high drop-out rate found in the study may, however, place limits on the significance result in inattention. Akhundzadeh et al. added zinc supplementation to psychostimulants in 44 children resulted in a greater improvement in symptoms than the use of the psychostimulant alone. Arnold et al. 's study  indicated zinc supplementation alone reduces ADHD symptoms in children, but other studies did not examine whether zinc was effective alone or not. In fact, zinc supplementation was not the primary intervention of these studies instead; zinc was administered with other treatment. Arnold's result was entirely different from Akhondzadeh et al. and Bilici et al. The possible reasons for the difference between these studies may be from polymorphism in population genetics, relative rate of zinc deficiency, background nutrition, inadequate dosage or insufficient absorption of anion (sulfate may be necessary). English abstract of other randomized double-blind clinical trial by Zamora et al. reported zinc supplementation about 10 mg/day had no effect on the total score of ADHD symptoms. Insufficient dose may cause different result with other studies but we could not get any more information from English abstract. Macronutrients may have important effects on ADHD symptoms and may affect the result of intervention studies. New evidence reported contradictory results between studies may be because of background macronutrient intake in a different country for example in Iran Esmaillzadeh et al. showed 4.2% of all calories consumed are derived from total fatty acids; that is more than the amount consumed in other developed countries. Zinc indirectly effects on dopamine metabolism and increases the affinity of methylphenidate for the dopamine transporter. Scientific evidence believes that dopamine is a very important factor in ADHD. , Recent studies have shown lower serum ferritin levels in children with ADHD than healthy children. Moreover, new evidence has indicated a potential role of changing brain iron metabolism. Data from magnetic resonance imaging and cerebrospinal fluid ferritin have shown a significant iron deficiency in children with restless leg syndrome (RLS). , Furthermore, intravenous iron therapy has been reported effective for symptomatic treatment of RLS. Konofal et al. conducted a double-blind RCT on 23 ADHD non-anemic children for 12 weeks. 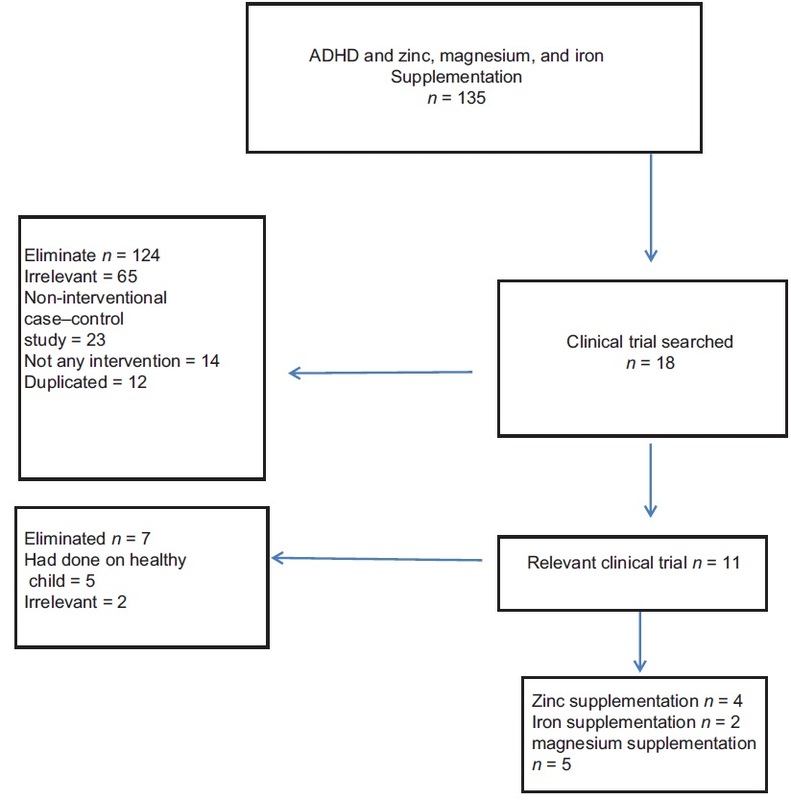 Iron supplementation had no effect on ADHD symptoms in this study. Moreover, in one study by Sever et al., iron supplementation lowered parents' Conners' Rating Scale scores. Children in Sever et al. 's study  were anemic so it may cause different result in comparing with Konofal's study. The most important finding of this systematic review about magnesium supplementation and ADHD is that the efficiency of magnesium supplementation as a mono-therapy was not investigated in any double-blind controlled trial. Huss et al. conducted a large study but his study was not a double-blind clinical trial. Moreover, supplements contained PUFA, zinc, and magnesium so the results couldn't directly related to magnesium or zinc supplementation. More than 50% of children in this study having oppositional defiant disorder besides ADHD so they may be different from other ADHD children. Mousain-Bosc et al. had done their study on a group of children from nursery school and their age was from 0 to 15 years. It is not clear whether the measures for diagnosing infants as an ADHD patient are valid and reliable in the mentioned study. Moreover, as their study was an open trial their result might have encountered to some biases. In addition, they did not have done any statistical report regarding the effect of supplementation on hyperactivity, impulsive, and inattention. Mousain-Bosc et al. in another study used Vitamin B6 in addition to magnesium; this study was an open trial so their result may have some biases. In addition, the measurement tool for ADHD score before and after the intervention was not familiar in this study and it was not reported on its validity and reliability. Diet is a very important factor in the treatment of ADHD symptoms and may cause different results in supplementation studies but authors in these studies did not assess dietary patterns. Azadbakht and Esmaillzadeh  showed the relationship between dietary patterns and ADHD among school-age children in Iran and they found significant independent associations between the sweet and fast-food dietary patterns and the prevalence of ADHD. The results of this systematic review revealed a mixture of positive and inconclusive evidence for iron, zinc, and magnesium in the treatment of ADHD. One article was about magnesium mono-therapy and in two other articles magnesium and Vitamin B6 supplement were used together and their results showed B6 and magnesium can be effective in ADHD children with hypo magnesium. Hence, magnesium supplementation in children without hypomagnesemia is not suggested until enough evidence is provided. These limited evidences should be examined in long-term double-blind randomized controlled clinical trial with enough sample size and follow-up. There was just one randomized clinical trial with iron supplementation in non-anemic ADHD children and one article on anemic children, their result showed no positive impact on non-anemic children and positive effects on anemic ADHD children, so we need more evidence until we can recommend iron supplementation for children with ADHD. Findings of these studies using zinc supplementation in ADHD are mostly positive. This systematic review showed that there are a few recent studies about mineral and ADHD and more evidence is required for showing whether mineral supplementation is effective in children with ADHD and we recommended replicating the randomized well-controlled trials. Tarver J, Daley D, Sayal K. Attention-deficit hyperactivity disorder (ADHD): An updated review of the essential facts. Child Care Health Dev 2014;40:762-74. Meysamie A, Fard MD, Mohammadi MR. Prevalence of attention-deficit/hyperactivity disorder symptoms in preschool-aged Iranian children. Iran J Pediatr 2011;21:467-72. Husarova V, Bittsansky M, Ondrejka I, Dobrota D. Correlations of ADHD symptoms with neurometabolites measured by 1H magnetic resonance spectroscopy. Bratisl Lek Listy 2014;115:635-42. Adeyemo BO, Biederman J, Zafonte R, Kagan E, Spencer TJ, Uchida M, et al. Mild traumatic brain injury and ADHD: A systematic review of the literature and meta-analysis. J Atten Disord 2014;18:576-84. Gao Q, Liu L, Qian Q, Wang Y. Advances in molecular genetic studies of attention deficit hyperactivity disorder in China. Shanghai Arch Psychiatry 2014;26:194-206. Akhondzadeh S, Gerbarg PL, Brown RP. Nutrients for prevention and treatment of mental health disorders. Psychiatr Clin North Am 2013;36:25-36. Puri BK, Martins JG. Which polyunsaturated fatty acids are active in children with attention-deficit hyperactivity disorder receiving PUFA supplementation? A fatty acid validated meta-regression analysis of randomized controlled trials. Prostaglandins Leukot Essent Fatty Acids 2014;90:179-89. McCann D, Barrett A, Cooper A, Crumpler D, Dalen L, Grimshaw K, et al. Food additives and hyperactive behaviour in 3-year-old and 8/9-year-old children in the community: A randomised, double-blinded, placebo-controlled trial. Lancet 2007;370:1560-7. Biederman J. Attention-deficit/hyperactivity disorder: A selective overview. Biol Psychiatry 2005;57:1215-20. Sonuga-Barke EJ, Coghill D, Wigal T, DeBacker M, Swanson J. Adverse reactions to methylphenidate treatment for attention-deficit/hyperactivity disorder: Structure and associations with clinical characteristics and symptom control. J Child Adolesc Psychopharmacol 2009;19:683-90. Maghsoudi Z, Azadbakht L. How dietary patterns could have a role in prevention, progression, or management of diabetes mellitus? Review on the current evidence. J Res Med Sci 2012;17:694-709. Bakhtiyari M, Ehrampoush E, Enayati N, Joodi G, Sadr S, Delpisheh A, et al. Anxiety as a consequence of modern dietary pattern in adults in Tehran - Iran. Eat Behav 2013;14:107-12. Golub MS, Takeuchi PT, Keen CL, Hendrickx AG, Gershwin ME. Activity and attention in zinc-deprived adolescent monkeys. Am J Clin Nutr 1996;64:908-15. Toren P, Eldar S, Sela BA, Wolmer L, Weitz R, Inbar D, et al. Zinc deficiency in attention-deficit hyperactivity disorder. Biol Psychiatry 1996;40:1308-10. Bekaroglu M, Aslan Y, Gedik Y, Deger O, Mocan H, Erduran E, et al. Relationships between serum free fatty acids and zinc, and attention deficit hyperactivity disorder: A research note. J Child Psychol Psychiatry 1996;37:225-7. Cortese S, Angriman M, Lecendreux M, Konofal E. Iron and attention deficit/hyperactivity disorder: What is the empirical evidence so far? A systematic review of the literature. Expert Rev Neurother 2012;12:1227-40. Curtis LT, Patel K. Nutritional and environmental approaches to preventing and treating autism and attention deficit hyperactivity disorder (ADHD): A review. J Altern Complement Med 2008;14:79-85. Burhans MS, Dailey C, Beard Z, Wiesinger J, Murray-Kolb L, Jones BC, et al. Iron deficiency: Differential effects on monoamine transporters. Nutr Neurosci 2005;8:31-8. Torimitsu K, Furukawa Y, Tsukada S. Role of magnesium in nerve tissue. Clin Calcium 2012;22:1197-203. Bussing R, Zima BT, Gary FA, Garvan CW. Use of complementary and alternative medicine for symptoms of attention-deficit hyperactivity disorder. Psychiatr Serv 2002;53:1096-102. Jadad AR, Moore RA, Carroll D, Jenkinson C, Reynolds DJ, Gavaghan DJ, et al. Assessing the quality of reports of randomized clinical trials: Is blinding necessary? Control Clin Trials 1996;17:1-12. Sarris J, Byrne GJ. A systematic review of insomnia and complementary medicine. Sleep Med Rev 2011;15:99-106. Pase MP, Grima NA, Sarris J. The effects of dietary and nutrient interventions on arterial stiffness: A systematic review. Am J Clin Nutr 2011;93:446-54. Bilici M, Yildirim F, Kandil S, Bekaroglu M, Yildirmis S, Deger O, et al. Double-blind, placebo-controlled study of zinc sulfate in the treatment of attention deficit hyperactivity disorder. Prog Neuropsychopharmacol Biol Psychiatry 2004;28:181-90. Arnold LE, Disilvestro RA, Bozzolo D, Bozzolo H, Crowl L, Fernandez S, et al. Zinc for attention-deficit/hyperactivity disorder: Placebo-controlled double-blind pilot trial alone and combined with amphetamine. J Child Adolesc Psychopharmacol 2011;21:1-19. Zamora J, Velásquez A, Troncoso L, Barra P, Guajardo K, Castillo-Duran C. Zinc in the therapy of the attention-deficit/hyperactivity disorder in children. A preliminar randomized controlled trial. Arch Latinoam Nutr 2011;61:242-6. Konofal E, Lecendreux M, Deron J, Marchand M, Cortese S, Zaïm M, et al. Effects of iron supplementation on attention deficit hyperactivity disorder in children. Pediatr Neurol 2008;38:20-6. Sever Y, Ashkenazi A, Tyano S, Weizman A. Iron treatment in children with attention deficit hyperactivity disorder. A preliminary report. Neuropsychobiology 1997;35:178-80. 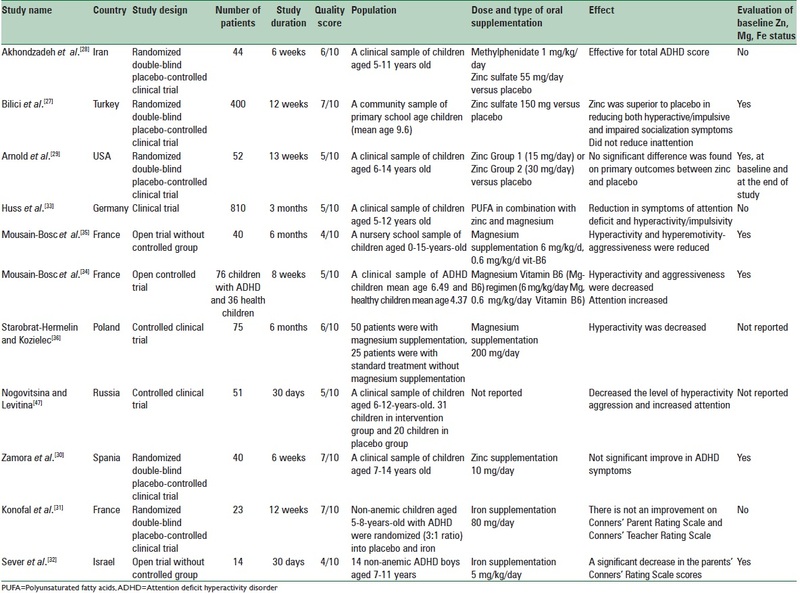 Huss M, Völp A, Stauss-Grabo M. Supplementation of polyunsaturated fatty acids, magnesium and zinc in children seeking medical advice for attention-deficit/hyperactivity problems - An observational cohort study. Lipids Health Dis 2010;9:105. Mousain-Bosc M, Roche M, Polge A, Pradal-Prat D, Rapin J, Bali JP. Improvement of neurobehavioral disorders in children supplemented with magnesium-vitamin B6. II. Pervasive developmental disorder-autism. Magnes Res 2006;19:53-62. Mousain-Bosc M, Roche M, Rapin J, Bali JP. Magnesium VitB6 intake reduces central nervous system hyperexcitability in children. J Am Coll Nutr 2004;23:545S-8. Starobrat-Hermelin B, Kozielec T. The effects of magnesium physiological supplementation on hyperactivity in children with attention deficit hyperactivity disorder (ADHD). Positive response to magnesium oral loading test. Magnes Res 1997;10:149-56. Esmaillzadeh A, Azadbakht L. Consumption of hydrogenated versus nonhydrogenated vegetable oils and risk of insulin resistance and the metabolic syndrome among Iranian adult women. Diabetes Care 2008;31:223-6. Hesse GW, Hesse KA, Catalanotto FA. Behavioral characteristics of rats experiencing chronic zinc deficiency. Physiol Behav 1979;22:211-5. Millichap JG, Yee MM. The diet factor in attention-deficit/hyperactivity disorder. Pediatrics 2012;129:330-7. Earley CJ, Ponnuru P, Wang X, Patton SM, Conner JR, Beard JL, et al. Altered iron metabolism in lymphocytes from subjects with restless legs syndrome. Sleep 2008;31:847-52. Allen RP, Barker PB, Wehrl FW, Song HK, Earley CJ. MRI measurement of brain iron in patients with restless legs syndrome. Neurology 2015;84:105. Sinn N. Nutritional and dietary influences on attention deficit hyperactivity disorder. Nutr Rev 2008;66:558-68. Azadbakht L, Esmaillzadeh A. Dietary patterns and attention deficit hyperactivity disorder among Iranian children. Nutrition 2012;28:242-9. Bac P, Maurois P, Dupont C, Pages N, Stables JP, Gressens P, et al. Magnesium deficiency-dependent audiogenic seizures (MDDASs) in adult mice: A nutritional model for discriminatory screening of anticonvulsant drugs and original assessment of neuroprotection properties. J Neurosci 1998;18:4363-73. Feillet-Coudray C, Coudray C, Wolf FI, Henrotte JG, Rayssiguier Y, Mazur A. Magnesium metabolism in mice selected for high and low erythrocyte magnesium levels. Metabolism 2004;53:660-5. Schmidt CJ, Taylor VL. Release of [3H] norepinephrine from rat hippocampal slices by N-methyl-D-aspartate: Comparison of the inhibitory effects of Mg2 + and MK-801. Eur J Pharmacol 1988;156:111-20. Nogovitsina OR, Levitina EV. Effect of MAGNE-B6 on the clinical and biochemical manifestations of the syndrome of attention deficit and hyperactivity in children. Eksp Klin Farmakol 2006;69:74-7.